Tatiana Soskin (also spelled Tatyana Suskin) is the 26-year-old Israeli immigrant from Russia who posted pictures of Islam's prophet Muhammad as a pig and, under U.S. pressure, found herself arrested by the Israeli government. I criticized the Clinton administration's position at "[Hebron Pig Poster Incident:] How Clinton Adheres to the 'Rushdie Rules'" and here will follow up on what's happened to Soskin herself. When 26 year old Tatiana Soskin was brought before a judge, he recorded her personal details. No, she has no job, replied the new immigrant from Russia. No, her parents are not in Israel, she is alone. No, she does not even have a telephone. Asked why she drew the by-now infamous caricature, she explains that "Arab leaders used the name of the prophet Mohamed when they called in the mosques to attack Jews. That seems to me a swine-like use of Mohamed's name, and that is what I tried to say with the drawing. It was my response to the incitement." "For 24 hours a day," she says, "I am alone in a small cell. I am not allowed to talk to anyone, I have no clean air, barely any light. At the corner of the room is a small hole in the floor, where, pardon my language, I take of my needs. Above it is a shower and opposite, a barred window. I cannot even respond to my needs or take a shower without being afraid someone will suddenly look through the window. "Most of the inmates work and can buy themselves things. I don't work, so I don't have money, not even for chocolate. On Friday I asked the jailers to bring me candles so I could light the Sabbath candles, but they didn't bring any." ... Tatiana says she reads and draws most of the day. Jerusalem District Court Judge Zvi Segal. Dec. 31, 1997 update: Jerusalem District Court Judge Zvi Segal convicted Soskin of committing a racist act, supporting a terrorist organization, attempting to give religious offense, and attempted vandalism. She cried as Segal read for over an hour from his 63-page judgment. He rejected defense arguments that about her being emotionally disturbed, ruling that she had acted with cool calculation, aware of the consequences of her acts. "The harm caused in this case is wide and offends all members of the Islamic faith." She acted out of a "patently racist motive" and with "clear intent" to provoke hatred and violence. Freedom of expression does not extend to displaying the posters in a Muslim neighborhood. Soskin remained defiant: "I don't agree with this conviction. I have nothing to regret. The whole legal system is one big mistake. I didn't expect anything good from this system." She faces a maximum penalty of 26 years in prison. By way of background, Section 173 of the Israeli criminal code requires a jail term on anyone who "publishes an advertisement that may blatantly offend the faith or religious sensitivities of others," or "states in public and within range of a given person a word or sound that may blatantly offend his faith or religious sensitivities." Jan. 9, 1998 update: Segal sentenced Soskin to two years in prison plus a one-year suspended sentence. According to the Los Angeles Times, "She smiled and waved to right-wing supporters as her term was handed down. The judge said posting the drawings in the West Bank city of Hebron in June was a 'revolting, degenerate' act." July 8, 1998 update: Soskin appealed to Israel's High Court and her case was heard on March 30, 1998; the verdict was handed down today. In brief, Supreme Court Justice Theodor Or rejected her arguments in their totality. First he ruled that "a position whereby every expression that has the potential to offend religious sensitivities will be considered a crime according to this law undermines the basic right to freedom of expression." 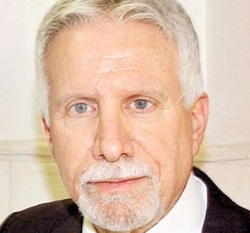 But then he went on to apply a ban on offending religious sensitivities, saying that Soskin's actions caused damage to the "interests of the members of that particular religion as a whole, as opposed to damage to the religious sensitivities of a given individual or another," and so deserved punishment. 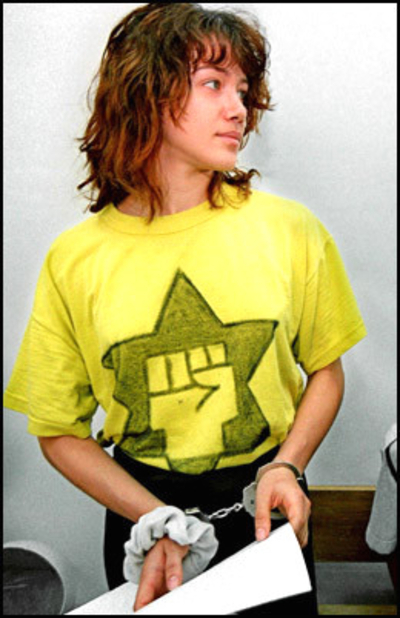 Tatiana Soskin in handcuffs but still defiant. Soskin at the Beer Ya'akov Mental Hospital for psychiatric exams to ensure she was mentally fit to stand trial: "I would rather be in a small mental hospital here than to live in the bigger mental hospital that is the State of Israel!" Soskin in her defense at the trial: "I haven't done anything I should be sorry about. I think it's a matter of freedom of speech ... how can somebody sit in jail for a drawing? It's only a drawing!" Soskin responding to Segal comparing her drawing to the Protocols of the Elders of Zion: "How can you compare a drawing to the actions of the Nazis and the slaughter of millions of our people? My motivation was love of Jews. My relatives who perished in the Holocaust would be ashamed to hear what you said! My grandparents died in the Holocaust but, if they heard this, they would die again!" Benjamin Netanyahu, prime minister at the time, told the mayor of Hebron: Tatiana's poster "contradicts the respect and admiration the Jewish religion has for the Islamic religion and its founder." Jan. 28, 2015 update: Click here for a brief video interview with Soskin (in Hebrew, English subtitles) during her 1998 Supreme Court appeal. She has harsh things to say about the government of Israel.